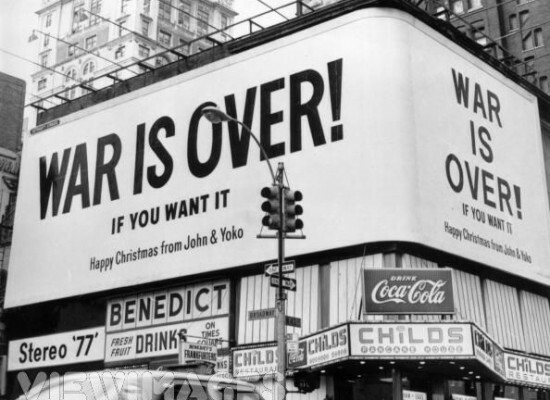 This is a billboard event John and I did 29 years ago, in Xmas of 1969. At the time, it created good vibrations around the world and gave people strength. The message is “We can do it”. and it’s still valid. If one billion people in the world would think peace – we’re gonna get it. You may think “well, how are we going to get one billion people to think? Isn’t this something we should leave to the politicians, who have the power to do those things?” Well, politicians cannot do anything without your support. We are the power. Remember, you don’t have to do much. The power works in delicate and mysterious ways. Visualize the domino effect and just start thinking positive, that we are all together in this. Thoughts are infectious. For this Holiday Season I wanted this to be a gift to you from John and I. Have fun with it. Stand in front of the Billboard. Take photos of yourselves, your friends and family. Send them out, so the message will circulate. Above all, have fun. I hope you have a good one. Lots of love.